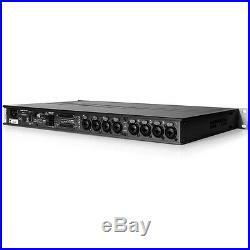 Audient ASP880 8-Channel Microphone Guitar Bass Plug & Play Preamplifier & ADC. ASP880 is an 8-channel microphone preamplifier & ADC that will transform your sessions into world class recordings, the perfect addition to your set-up. ASP880 provides eight of Audient's renowned console mic pres, pristine converter technology and a versatile feature set that includes Variable Impedance and Variable High Pass Filters. All in a 1RU rack! 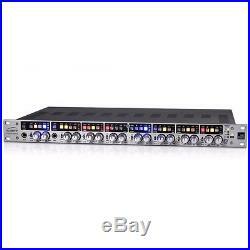 8 Audient Console Mic Pres. All new, Burr Brown AD converter technology. 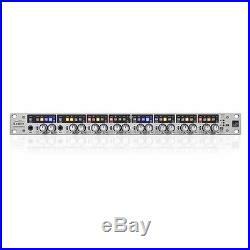 8 Insert points between the mic preamps and AD converters. 2 Channels of Class-A Discrete JFET D.
Digital Outputs - ADAT, AES & S/PDIF. Transform your sessions into world class recordings with ASP880, the perfect addition to your set-up. Bypass the mic pres and converters in your current interface and achieve the same audio excellence as the top studios. World Class Mic Pres: The Professional Sound You Deserve. Audient's renowned Class-A, console mic pre outshines the competition and gives you the same sonic quality of products costing three or four times the price. Capture the detail and excitement of your audio sources, all with a hint of analogue colouration that will sound stunning on any project! Developed by design legend David Dearden, our mic pre is used by thousands of professional studios around the world. 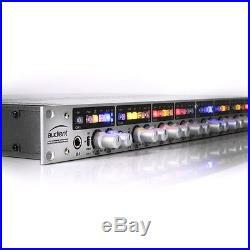 ASP880 provides you with the highest grade converters from Burr Brown, the leaders in converter technology. The integral ADC guarantees you will have the best conversion possible. This isn't just the best converter in a mic pre either, it stands up against dedicated converters too. You can focus on the music and let ASP880 take care of the rest. Plug and Play: Plug Straight in and be Inspired. As well as offering you 8 channels of mic pre and line inputs, ASP880 has two sonically accurate discrete JFET DI inputs, so you can plug your guitar or bass straight in. Take Control: Enhance Your Audio with ASP880's Versatile Feature Set. Bring your outboard in from the cold. Ever wanted to add compression or EQ to your signal before going to the computer? Well with ASP880 you can. Simply insert any analogue processor before the converters - its as easy as that! The A-D button allows ASP880 to function as an 8 channel mic pre while you use the converters separately in stand-alone mode. Say Goodbye to Pesky Low frequencies. Lose those unwanted low frequencies with a simple to use variable high-pass filter. The result is a clean, ready to record signal. Wrap it up with a ribbon. If youre partial to the character of ribbon mics, then ASP880 is made for you. Variable impedance allows you to match the pre to your favourite ribbon mic. Retain the punch and frequency response the mic was born with. It also works on your other mics, just more subtly. Built to Last: Quality Deserves Protection. ASP880 has been designed to last, its all-metal construction and hand milled aluminium knobs will stand up to countless late nights in the studio and days on the road. 10 to +60dB (-10dB Pad). 16 to +44dB (-10dB Pad). Mic LO: 220 Balanced Mic MED: 1k2 Balanced Mic HI: 2k8 Balanced Line (All Z): >6k Balanced. +/-0.5dB 10Hz to 100kHz. Sweepable from 25Hz to 250 Hz, 2nd Order (12dB/Octave). Pin 2 (Hot), Pin 3 (Cold) & Pin 1 (Shield). TIP (Hot), RING (Cold) & SLEEVE (Shield). Line input level at the combi jacks will be affected by the input impedance switch position, this can be used as a second pad control to adjust line input ranges on all channels. I (Channels 1 & 2). (measured to line outputs / insert send). 10 to +60 dB (-10dB Pad). +/-0.5dB 10Hz to 50kHz. TIP (Hot) & SLEEVE (Shield). (measured at optical output under AES-17). +/-0.5dB 10Hz to Fs/2. Variable Brightness from -30dBu to -10dBu (-28dBFS). High stability, low noise internal SMPS. Works anywhere in the world without reconfiguring. The item "Audient ASP880 8-Channel Microphone Guitar Bass Plug & Play Preamplifier & ADC" is in sale since Tuesday, April 11, 2017.